William Boyd was the son of John David and Eliza Boyd. William was born about 1887 near Pomeroy. His father was a farmer. William served in Limerick, Newry and Belfast with the Royal Irish Constabulary. 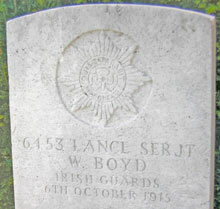 Lance Sergeant William Boyd was serving with the 2nd Battalion of the Irish Guards when he was severely wounded by shell fire in the attack that followed during the Battle of Loos. He was taken to hospital in Dieppe, but he died of his wounds there on Wednesday 6th October 1915. Dieppe is a seaport at the mouth of the River Arques. Janval is one of the suburbs of Dieppe and the 'Cimetiere de Janval' is one of the town cemeteries. It is situated to the south-west of the port area. From the town square, the Place du Martyrs, head south on the Avenue Gambetta (direction Rouen), then take the 3rd exit on your right into the Avenue Boucher-de-Perthes. The cemetery entrance is at the end of this road on the Rue Montigny. A CWGC sign is at the entrance of the cemetery. 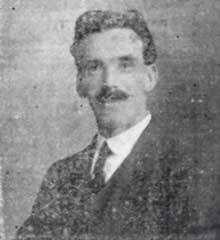 5 Presbyterian ROH Pomeroy William Boyd. Killed in action. 7 The Irish Guards / RIC Forum discussion listing casualties both RIC and Irish Guards. photos.